This 132-acre park is a favorite for birders, canoers and kayakers along the Upper Cuyahoga River, a state-designated Scenic River. Two trails total .87 miles. Children can have fun on a playground here. 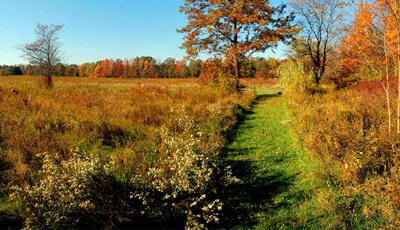 A section of the statewide Buckeye Trail also passes along the roadway bordering Eldon Russell Park. Please note that high water may make the riverside trail inaccessible. 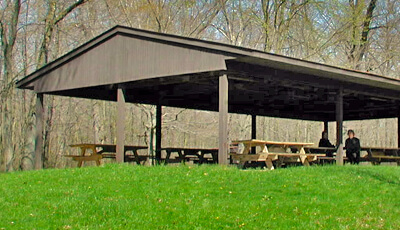 Horwath's Shelter is a tucked into the woods riverside in a beautiful way. There are few things quite as soothing as a stroll along the river and into the woods. Catch a rare glimpse at some very unique species of wetland plant and animal life. Flat expanses along the Cuyahoga River define an old Ice Age lake bed that once occupied the valley. This park’s landscape is also characterized by kames (knolls of sand and gravel formed by melting glaciers) and kettles (wet depressions left by the melting of buried blocks of glacial ice). Soggy kettle holes harbor a number of rare wetland plants. Swamp forests of elm, ash, silver maple and swamp white oak thrive on poorly-drained flats along the river. Kames support an upland forest of beech, maple, oak and a majestic stand of native white pine. Deer, turkey and other woodland wildlife can be found here. 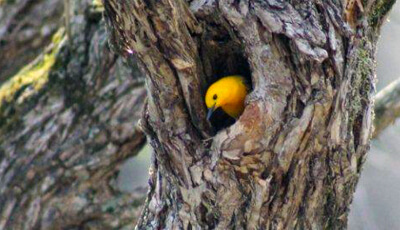 Many kinds of wetland wildlife may be observed along the river, including beaver, muskrat, mink, heron, Wood Duck and the rare Prothonotary Warbler. Beautiful blooms of pickerelweed, cardinal flower, water lily, spatterdock and buttonbush grave the river’s edge each summer. A large field at the western edge of the park is managed as grassland. Wildlife that benefit include Eastern Bluebirds, Eastern Meadowlarks, swallows, bobolinks and a variety of mammals and insects.